Originally planned for release today (8/23), at least according to the trailer below, Hue will be hitting PC, Mac, and Linux via Steam on August 30. The game is also coming soon to Xbox One via XBLA, and PS4 and Vita via PSN. Developer Fiddlesticks Games offers up a tale of a boy named Hue who is searching for his mother in a monochromatic world. Fortunately, Hue has control over the hues around him by way of a color ring. 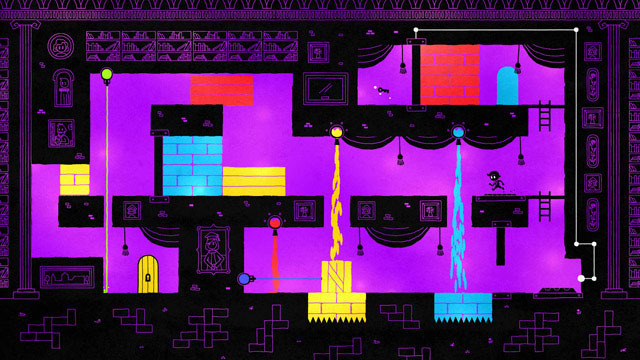 By changing the color of the background to match the color of nearby objects, they become transparent, allowing Hue to walk safely through them, which is the basis for the game's puzzle platforming challenges. Time slows down a while making color transformations, allowing for some on-the-fly changes while jumping between colored obstacles and pits of spikes.